Yikes! My first real pattern that I came up with myself. It’s a simple pattern that can be dressed up or dressed down depending on the skill level of the knitter. I am aiming this pattern towards a beginner knitter who has a friend or family member who just had a baby and they want to give a simple gift. I call this pattern the Easy Peasy Baby Blanket. I made this blanket for my cousin who just had a baby. Here’s how I did it. US 6 straight or circular needles. I recommend circular because the weight of the blanket will be supported by the cable connecting the needles. 5 stitches in stockinette stitch to one inch on US6 needles. Gauge is not really important for this pattern. My finished dimensions: Width: 25 ½ inches. Length: 25 inches. Cast on stitches in multiples of eight. You can make this blanket as big or a small as you’d like. Repeat rows one and two. Continue until the blanket is the size you want or until you are almost out of yarn. This will curl a little bit due to the stockinette stitch, but the border will help keep it from curling a lot. You can make the top and bottom border bigger if you’d like, just increase the amount knit in multiples of four. Other ideas for this blanket: A more advanced knitter would be able to do an intarsia pattern in the body of the blanket using any sport or DK weight yarn. 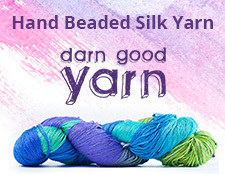 You do not have to use a jacquard yarn, but rather a solid color if you’d prefer. I hope you enjoy knitting this blanket and if you have any questions, please leave me a comment. 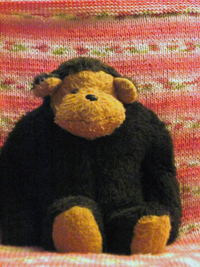 Oh, the monkey in the photo is one of the first stuffed animals I ever received as a baby. He’s a special monkey.